5: The food, the food, the food....nothing like voodoo chips!!! 1: Kappa Nu winning Silver, I am so proud of those girls and know that this is just the first of many!! We ended our convention with a sisterhood session lead by Dr Mari Ann Callais. 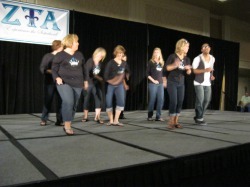 From this last session we Danced our way to our Jazz Brunch getting a chance to hear a few more songs and to watch a sneak peak of the convention video. 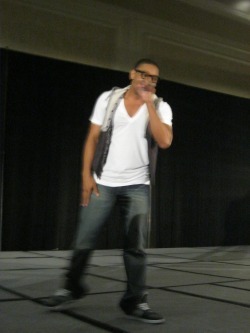 This video is a gift to each attendee and When I recieve my copy, if it is not too long, I will post it on here. We then formed a sisterhood circle and sang Friends. I hope you all enjoyed hearing about convention! 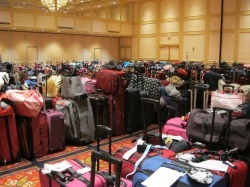 Today is our last full day of convention so our business meeting was full. Academic Achievement Awards were first on the list, Zeta Lambda won commendable and with HIGHLY commendable were KAPPA NU, Theta Xi, Iota Iota, Iota Psi, Kappa Omicron, Iota Gamma and Kappa Xi. Our National GPA is a 3.1, WOW! 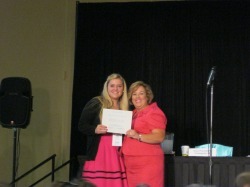 The Margaret Dunkle Hardy award for most improved GPA went to Delta Pi chapter. 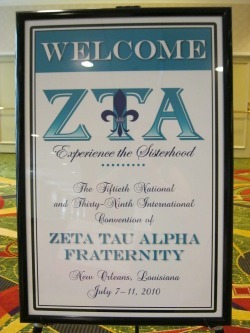 And the invitation for convention was extended, the 2012 convention will be at the Louisville International Convention Center. Get ready for your Mint Juleps! Today's lunch was all about giving. Founders Club Recognition was given to 87 chapters and 4 individuals. 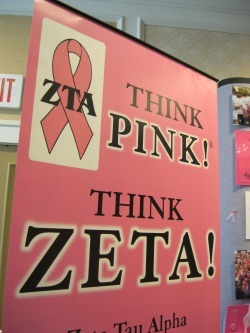 In our area at the $10,000 level were Zeta Lambda, Theta Xi, Northern NJ, and Iota Psi. At the $50,000 level was Kappa Xi. 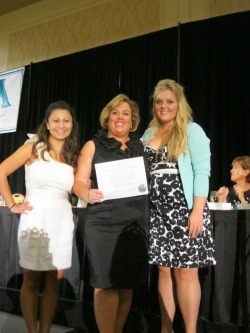 This year they added a new level the founders club $300,000 level and this was given to Alpha Xi chapter. Great job!! We also heard from Betty Nguyen our outstanding alumnae award winner. 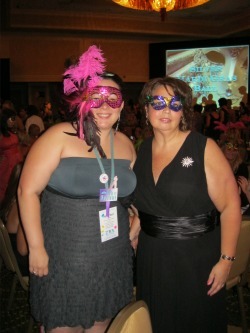 After an alumnae brainstorming session we had free time till the Silver Mardi Gras Ball. 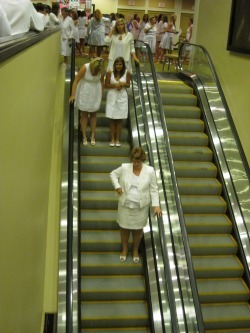 Most sisters used this time to either catch up on sleep or to walk around the french quarter. And then came the big night, SILVER AWARDS!!! What a treat it was that for dessert tonight we were able to experience a Banana's Fosters show, amazing. And then it was time for awards and wow was that amazing for Jersey. 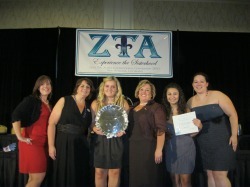 We had 5 silver winners, but the one I'm sure every jersey shore sister is most proud of is KAPPA NU, they won their first national silver in Alumnae-Collegiate Relations Award. Kappa Xi won 2nd runner up for Nelly Galloway Shearer Achievement, and Iota Gamma won Standards and Enrichment 2nd runner up. For our Alumnae Northern New Jersey won 2nd runner up Alumnae Public Relations and Mercer-Bucks won Alumnae Chapter Programming award. Congrats to these and all the other winners. Happy Pink Day from convention. 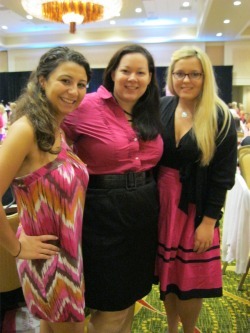 Today we honored our philanthropy by wearing pink. Some highlights from the second business meeting: "ZETA" is now a registered trademark of Zeta Tau Alpha, The General Manual will be available on the national website this fall. After a session on the new element of My Sister, My Responsibility with Dr. Lori Ebert, we attended our philanthropy lunch. 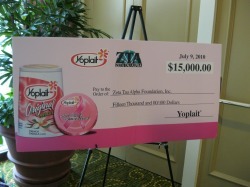 Here we learned that Think Pink NFL had 41 events this year, and that General Mill (Yoplait) is donating $15,000 to ZTA. With 25,995 lids collected Iota Theta is the number won collector of yoplait lids. 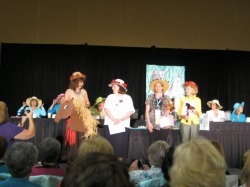 Montgomery county is the largest alumnae collector, having handed in 9,742. This year we will be able to send our lids directly to yoplait and there will be NEW collection materials. Our goal is to collect 350,000 lids and have 100% participation. Tonights dinner was the alumnae crown chapter dinner and JERSEY SHORE WON!!! 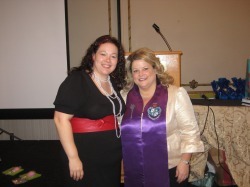 Other crown chapters include Central Jersey, Mercer-bucks, NYC, NNJ, and South Jersey. After dinner was our wonder sisterhood ice cream social. Special guests include DJ Skilla and the FAB step team from Epsilon Chapter. Believe me when I say YouTube did not do them justice. Thursday is here and with it the opening business meeting. President of Kappa Nu did the response to the Welcome and after roll call they announced the Helping Hands Awards, 21 chapters including 1 alumnae chapter received this award. Baby Cups were awarded to any new chapters at this meeting. 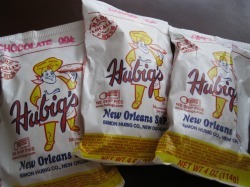 During our sponsored break we were served beignets. From there alumnae had a session on the NEW Bill Highway system. It is a very exciting change for us and we will hopefully be starting to use it this fall. Lunch's theme was "Sisterhood in Action" and after a lovely meal of soup and salad with a torte for dessert Foundation Scholarship Recipients were announced. 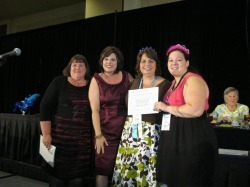 Thirty winners were present at Convention and in our area Deborah Howell of Iota Psi was a winner. 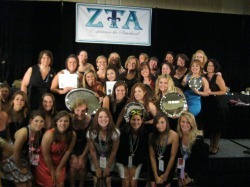 Thirteen Chapters won Finance Awards including Iota Iota, Theta Xi and Kappa Xi. 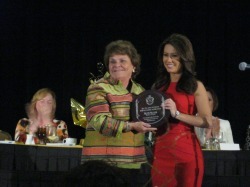 The Vivian Ulmer Smith Recruitment Award was won by Nona Richie. After Mrs Mauro's State of the Fraternity, Iota Gamma and Iota Psi were awarded with a front of the line pass for Ice Cream Night due to their timely participation of the collegiate Assessment survey this fall. Alumnae had the afternoon off for private shopping and tours of the Historical Exhibit. 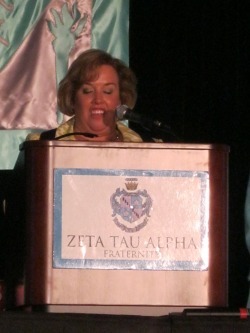 Tonights dinner has the theme of "Krewe of Crowns" and Convention Initiate, Tanya Snyder will speak. After dinner we will perform the initiation service. 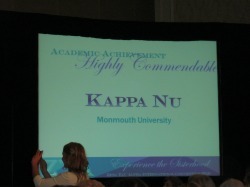 I am proud to let you know Kappa Nu has won Crown Chapter along with Iota Iota, Zeta Lambda, Iota Gamma and Kappi Xi. 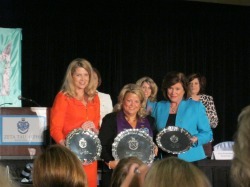 Outstanding Advisor winners are: Area I Janel Thompson, Area II Jennifer McPherson, Area III Daphne Emmack Owens. 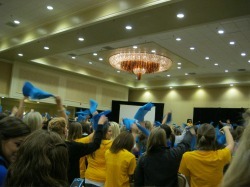 Tomorrow is Alumnae Crown Chapter!!!! Happy Wednesday! After signing into the hotel we had a quick lunch, visited the historical display and then we walked down to the grave of a voodoo queen. I thought that I was going to have nothing to write about today because when we woke up it was down pouring out. Luckily by the time it was time for Donna to head over to the hotel it had mostly cleared up. After taxi-ing it down with Donna to the French quarter we headed to the original Krystals (white castle) for lunch. Wow…so I knew it was going to be hot but the humidity down here is incredible. 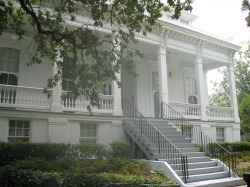 I forget a few things in my packing so Mary Elizabeth (my fab Gamma Beta Sister) and I did a quick walk through the Garden District to a CVS and I picked up what I needed along with a tasty fruit pie that is made down here to have for breakfast. Happy 4th of July!!! 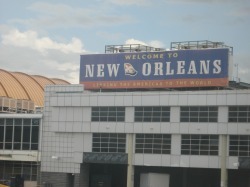 After a super easy flight Donna and I landed in New Orleans 20 Minutes early. After relaxing a bit we caught a streetcar down to Bourbon Street. The best way I can describe Bourbon Street to you is that its like a bar in the early 90s before they banned smoking. Even with it being open and outdoors it even smells like a bar! Hi! 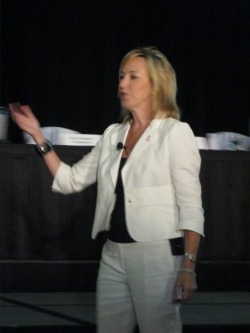 I'm Heather, current JS President and JS official Delagate. This is my experience at my second Convention. Also here, sharing this experience are Donna (Treasurer and PP) and several of my Gamma Beta Sisters.